NICOLE RICHIE NEWS: Nicole Richie's Top 10 Twitter Questions! 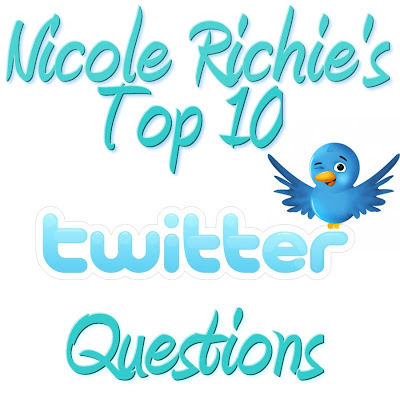 Nicole Richie's Top 10 Twitter Questions! Lastnight Nicole Richie tweeted: Going @joelmadden style tonight & answering the first 10 questions that I get from you guys. GO. @nicolerichie are you breastfeeding sparrow? @nicolerichie what is ur favorite breakfast? @nicolerichie Do u plan on doing any more acting? sure. Can I have 1000? @nicolerichie what is your favorite snack food? Gummy Peaches from a place called Joans on 3rd. @nicolerichie have you bin to India yet? it's beautiful wit history. no, but I want to so bad. @nicolerichie plan to write another book!? yes, it will be out this summer. @nicolerichie what's your fav clothing to steal from @joelmadden? @nicolerichie what hair products do you use to get your hair in loose waves? I use Moroccan Oil. and i actually wave my hair with a flat iron. I know that sounds weird but it works. Wow, that was great. I hope Nicole Richie does another Twitter top 10 questions. So now we know Nicole Richie loves McDonalds, She is going to be on our TV/Cinema screens very soon, she has a book coming out in the summer and she wants to travel to India! If you could ask Nicole Richie any question, what would it be? I'd love to interview Nicole with your questions! SOO COOL, HOPE SHE DOES IT AGAIN. WHAT DOES SHE US TO WASH HER FACE?